Martin Fitzgerald Lawrence is an American stand-up comedian, actor, producer, and writer. 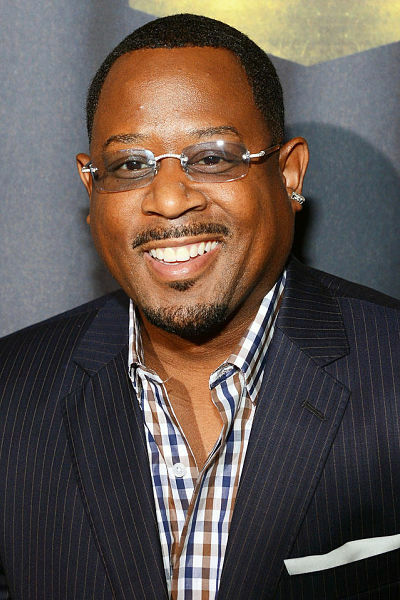 Lawrence came to fame during the 1990s, establishing a Hollywood career as a leading actor, most notably in the television sitcom Martin and the films “House Party”, “Boomerang”, “Bad Boys”, “Wild Hogs”, “Nothing to Lose”, “Blue Streak”, “Life”, “Big Momma's House”, and “A Thin Line Between Love & Hate”. From Wikipedia, the free encyclopedia. Description above from the Wikipedia article Martin Lawrence, licensed under CC-BY-SA, full list of contributors on Wikipedia. Continuing adventures of Miami detectives Mike Lowrey and Marcus Burnett caught up in cases involving car chases and explosions. Martin Lawrence leads an all-star cast, including Cedric the Entertainer, Mo'Nique, and Mike Epps, in the hit comedy \Welcome Home Roscoe Jenkins.\ When a celebrated TV show host (Lawrence) returns to his hometown in the South, his family is there to remind him that going home is no vacation! It's one outrageous predicament after another when big-city attitude and small-town values collide in this hysterical comedy critics are praising for its \over-the-top hilarity!\ (Roger Moore, Orlando Sentinel). Boog (Martin Lawrence), a domesticated grizzly bear with no survival skills, has his perfect world turned upside down when he meets Elliot (Ashton Kutcher) a scrawny, fast-talking mule deer. When Elliot convinces Boog to leave his cushy home in a park ranger's garage to try a taste of the great outdoors, things quickly spiral out of control. Relocated to the forest with open season only three days away, Boog and Elliot must acclimate in a hurry. They must join forces to unite the woodland creatures and take the forest back! Master jewel thief Miles Logan has a big problem. A $20 million dollar problem. Recently released from prison for the botched heist of a huge diamond, he's anxious to retrieve the hot rock which he hid at a construction site two years earlier. Comic stars Eddie Murphy and Martin Lawrence co-star in this funny and thoughtful film about the value of life. When the two find themselves shipped off to a Missouri prison for a life term in the 1930s they must learn to deal with the hand life has dealt them... and with each other. Fans will love Murphy and Lawrence as a new kind of "odd couple," aged through the film with Rick Baker's striking make-up effects. Nick Beam, an advertising executive who thinks his life is going very well -- until he returns home from work and discovers that his wife is apparently having an affair with his boss. On the edge of a nervous breakdown, Nick drives around the city until small-time carjacker T-Paul jumps into his truck and attempts to rob him. Will Smith and Martin Lawrence team up as partners in crime - crime-fighting that is - in this action-packed flick about a couple of good guys who are real Bad Boys! One hundred million dollars worth of confiscated heroin has just been jacked from police custody. When the drug investigation turns deadly, the murderers kidnap the only witness, a beautiful police informant (Tea Leoni) and close friend of the boys, which makes things get personal! Fast cars, a gorgeous woman and non-stop action make Bad Boys a guaranteed good time! A half-hour, multi-camera comedy centered on the newly established partnership of high-end elitist lawyer Allen Braddock and for-the-people, ethics driven lawyer Marcus Jackson. When a court ordered sanction teams Allen Braddock with Marcus Jackson in hopes that some of Marcus' conscience will rub off, the two find themselves in a partnership nature never intended. A hilarious, insightful, and ultimately devastating day in the life of a Brooklyn street on the hottest day of the year when tempers are flaring. A brilliant study of racism that has never been surpassed in the years since its release. One of New York filmmaker Spike Lee's most accomplished and nuanced films, featuring astonishing performances by the entire cast.